As Creative Developer and certified Gallup Clifton Strengths coach at Block Paper Print, my passion is facilitating colleagues, peers, and families through the art-making process, ensuring that they comfortably express their personal narratives through art. The exchange portfolio, a process unique to printmaking, provides people the opportunity to both create and collect artwork in accordance with ideas of their choosing, and with people they know. The exchange portfolio is a collecting and creating method specific to the process of printmaking in which a group of artists create fine-art prints specific to a theme. The number of prints each artist makes varies depending on the portfolio, as each artist receives one of every other artist’s work. Fine-art prints in portfolio exchanges exist only within that specific portfolio, and usually do not enter the commercial art market, as doing so would break up the portfolio. 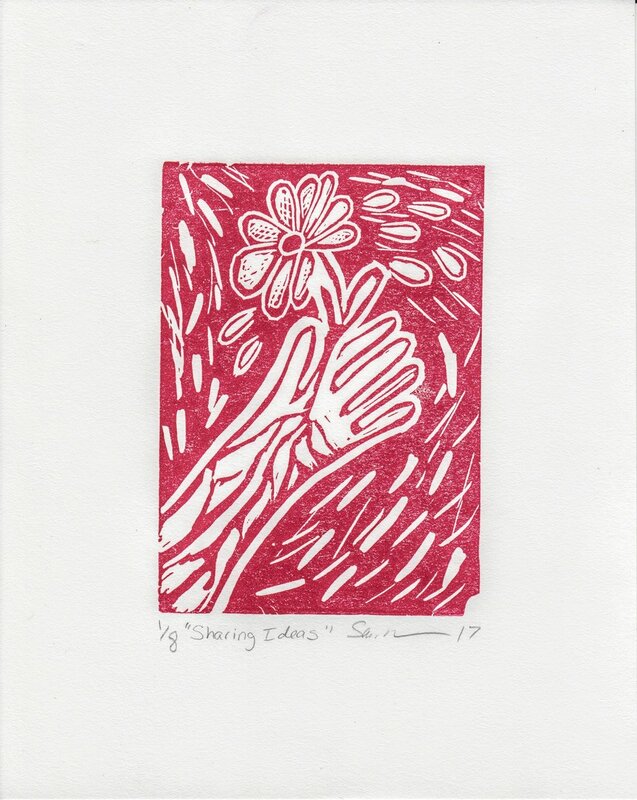 For this reason, participants enter into exchange portfolios to receive exclusive works from those they admire- and to discover new artists in the printmaking arena. Creating the work you want to create and collect with your peers is a gratifying way to build an art collection. 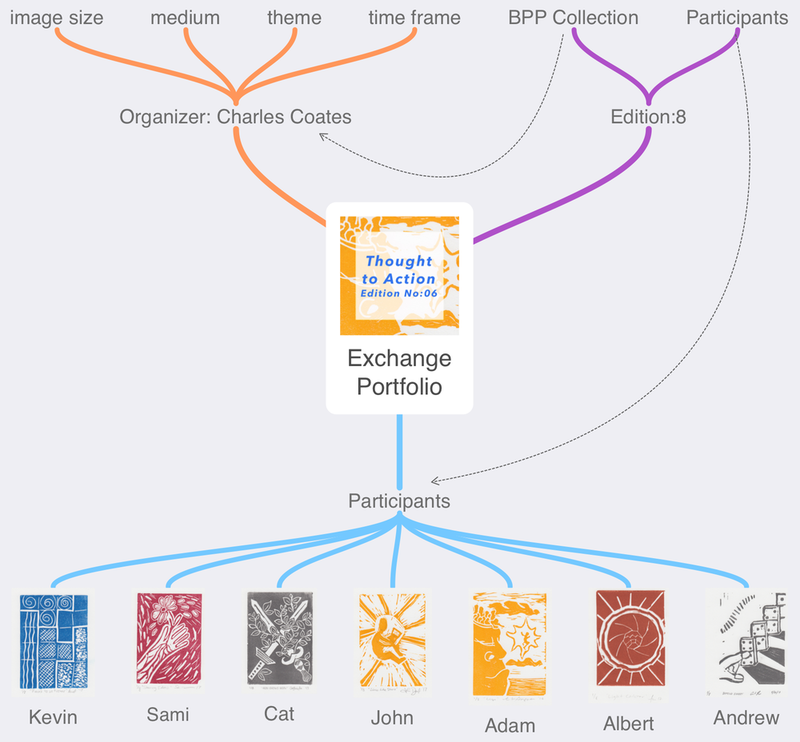 To put it another way: Exchange portfolios provides an approachable way to collect the artwork of those you admire. In this example, the organizer (myself), invites individuals to participate in the exchange. In this particular exchange, each person has 4 hours to create an edition of eight 5” x 7” relief prints portraying their perspective on the theme: Thought to Action. Consequently, each artist receives a portfolio consisting of seven prints (one from each participant). The formal criteria set by the organizer (size, medium, date) serves to highlight two individual aspects each participant has to offer: Concept and craft. An artist’s concept and craft work together to create compelling images, and are of equal importance. Through the limitations set by the organizer, which can be thematic as well as formal, each participant’s individual approach to concept and craft highlight their creative problem solving capabilities. Concept is a participant’s idea to interpret the portfolio’s given theme. Themes in each portfolio can be broad or specific, as can be the conceptual approach by the individual participant. Examples of themes include: Family Secrets, Snakes & Ladders, and From All Directions. These themes offer multiple jumping off points a participant may take to communicate their concept. One may choose to take a political, abstract, or narrative approach to the theme. However, no matter what direction a participant chooses to take their concept, each viewer of the finished work must see the theme as the underlying structure of the idea. Craft is the formal way participants create their image using the elements of art: form, line, texture, color, shape, and space, to communicate concept of an image. The principles in which each participant implements these components emphasizes their approach to telling a visual narrative. Some works may have movement, others balance. If concept is the story, craft is how the story is told. What I observe through my workshops is that once people begin sketching out their initial images, the process becomes intuitive and reactionary. Ironically, it’s the conceptual aspects - thinking of what you want to say- of image making that most often act as a barrier of entry. The artwork in Thought to Action is a perfect example of conceptual and technical power working together to communicate theme. In this portfolio, each participant expresses their perspective on that moment when an idea becomes reality. The participants in Thought to Action are colleagues on a team working for a Fortune 500 company in the Bay Area. Exchange portfolios provide a trifecta for the participant: They create one piece of art, collect many, and gain experience and a great story behind their art collection. Each work of art has a separate meaning, yet all communicate the same theme. Ready to participate in a _exchange portfolio_ with colleagues or friends? Book a free consultation, and let’s talk. Click the linkbelow to check out exhcange portfolios from various workshops including teen-leadership, corporate, and family. Special thanks to Miranda K. Metcalf of Davidson Galleries for editing.